INTRODUCTION: Liver cysts are often asymptomatic. Symptomatic liver cysts are uncommon and can be managed by percutaneous aspiration, laparoscopic/open marsupialization, or resection. Prior to the era of laparoscopic surgery, open surgical deroofing was considered to be the most appropriate therapy for uncomplicated simple hepatic cysts. 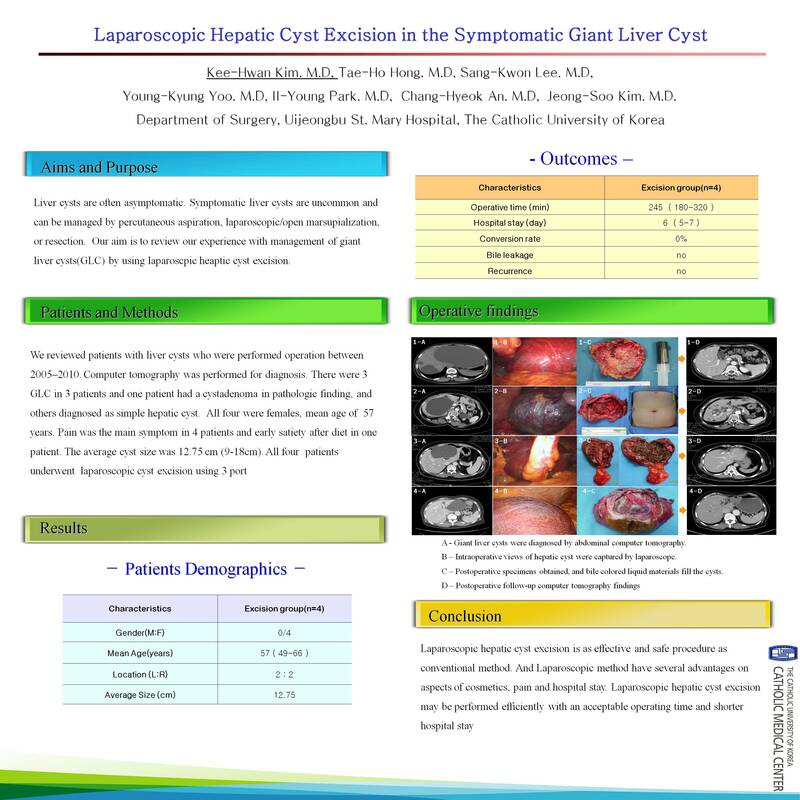 Recently, there have been a number of reports of successful laparoscopic cyst excision of symptomatic hepatic cysts. Simple aspiration of these cysts is associated with a high recurrence rate. Deroofing is often associated with a bile leak. Hepatic resection have been found to be effective in the symptomatic giant liver cysts(GLC) management. Our aim is to review our experience with management of GLC by using laparoscopic hepatic resection. MATHODS AND PROCEDURES: We review of patients with liver cysts between 2005–2010 was performed. There were 4 GLC in 4 patients and one patient had a cystadenoma in pathologic finding, All four (100%) were females (mean age of 57 years). Pain was the main symptom in 4 patients and early satiety after diet in one patient. The average cyst size was 12.7cm (9-18cm) with 4 cysts. All four patients underwent laparoscopic hepatic resection. RESULTS: Average operation time was 245 minutes(180-320minutes). All patients had an uneventful recovery, with no major morbidity. All patients were discharged from 5th to 7th postoperative day. Symptomatic relief and reduction in abdominal girth were obtained in all patients, persisting for an average follow-up period of 19 months. No progression of cystic disease has been observed clinically or by computed tomography and hepatic function was preserved. All patients had no complications.